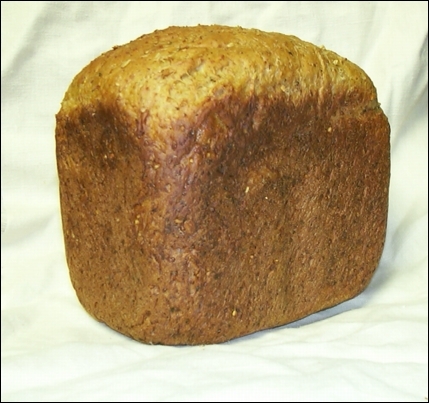 After a couple of years of testing I have settled on this recipe as a great every day bread. 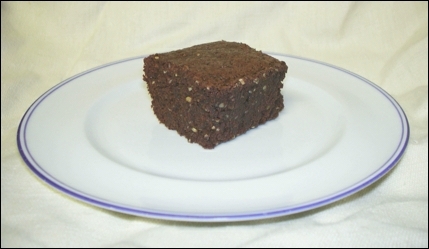 It has a nice crumb, excellent flavor and is not too dense. It makes wonderful toast for breakfast and the kids love their peanut putter & jelly sandwiches on it. Hemp and the Rule of Law, a documentary by Kevin Balling, a lecturer at Appalachian State University's Department of Communication, will be shown on "North Carolina Visions," UNC-TV's independent film series, November 5th at 11 p.m. The documentary traces hemp's past in U.S. agriculture and chronicles the debate to return the crop to American farmers. Thirty-one countries, including Canada, England and the European Union, now grow hemp. Hemp and the Rule of Law addresses renewable energy, sustainable agriculture, national security and the war in Iraq and also examines hemp's role in achieving a "green" industrial future. The Hemp and the Rule of Law DVD is now available as a gift for a donation to Vote Hemp or direct from the film maker at Tin Roof Video. Here is a two minute video short in Real Player format. It is a wonderful documentary and well worth seeing and sharing. You should consider getting a copy Hemp and the Rule of Law and have a hemp party. Order some Hemp is Hip, Hot & Happening from the Hemp Industries Association, print some hemp PDFs you can download from IndustrialHemp.net, and make some hemp smoothies and hemp brownies and you and your friends are set for a great educational experience. Film maker Kevin Balling has also agreed to grant copyright permission for the documentary to be shown on local cable access TV. Please email Kevin at Tin Roof Video for details! The October 2005 issue of the Manitoba Harvest Messenger is up on their web site and it has a nice selection of harvest photographs. Please click here or on the photo above to go to the Manitoba Harvest Messenger page. The FAO Networks EUROFLAX bulletin number 23 is now available for download on the Hemp Report Subscribers Index Page. You will need the username and password to log in. If you are not a Hemp Report subscriber please see our FAQ on how to become a subscriber. Back issues of the FAO Networks EUROFLAX bulletin are available as well. Pets get a healthy boost with NuHemp dietary supplements and wellness products... powered by Hempola. GUELPH, Ont. -- NuHemp, a revolutionary new offering -- the brainchild from product development company KicX Nutrition Inc. teaming up with Hempola Inc. -- is giving pets a natural, healthy boost. "We are introducing an exciting and innovative all natural line of fortified dietary supplements and treats for dogs," states Doug Daymond, President of the Guelph-based company, "Hempola presented the concept to us a year ago and we're now seeing an outstanding response to our initial launch of the product line. NuHemp is a Canadian developed and manufactured line of cutting-edge, natural products that provide dogs the natural nutrients needed to support health, vitality and longevity," he said. The common foundation for all of the NuHemp products is the inclusion of hemp nutrients -- either oil or meal from hemp seeds -- nutraceuticals, and all-natural holistic ingredients for targeted wellness and therapeutic properties. Hemp oil is nature's richest source of essential fatty acids while hemp meal is a whole food powder that's rich in complete protein, branch chain amino acids, essential fatty acids and healthy dietary fibre. Other ingredients are MSM (Methylsulfonylmethane), a naturally occurring form of sulfur compound used by the body to build connective tissue and amino acids; FOS (FortiFeed), a prebiotic fibre for companion and commercial animal feeds to promote a healthy digestive track; and Bio-MOS, an innovative advance in biological gut microfloral modifiers to work against bad bacteria and flush it away. NuHemp's pet nutrition line is designed to boost health and contains hemp products that are a nutrition powerhouse. Hemp contains the highest concentration of Omega 3, 6 and 9, which are known as good fats. As well, hemp is an incredible protein and dietary fibre that's gluten free, and with Vitamin E to boost health, it keeps the products fresh for months. Canada has taken a leadership role in the research, development and manufacturing of hemp food products. Researchers in the agri-food industry are discovering new nutritional and health benefits from foods, leading to new value-added products designed to enhance health. A leading company, Hempola Inc., was the first Canadian company to launch hempseed oil in 1996 and later invented hemp seed flour in 1999. 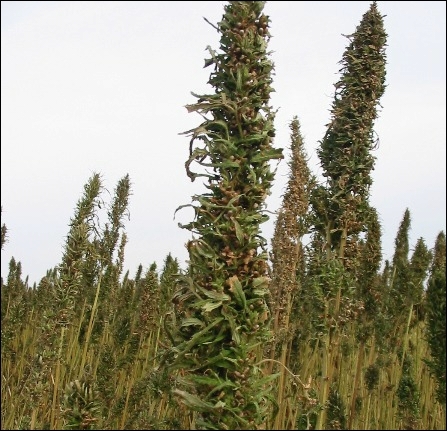 The botanical name for hemp is cannabis sativa and is one of Canada's newest crops, grown commercially since 1998. It's also one of the country's oldest crops, cultivated as early as the 1600s by Huron natives in the Georgian Bay area. The NuHemp product line consists of Omega Sauces, 2-Chomp Munchies, PrOmega Powder, PAWZitive Therapy Conditioning Stick and an MSM Soothing Tropical Gel. They are made from the finest natural ingredients and produced in small batches to ensure freshness and nutrient integrity. • Omega Sauces are made from pure, natural oils fortified with nutraceuticals and naturally flavoured. Each dose added to the pet's food will deliver much-needed therapeutic nutrients. Flavours are roasted chicken, luscious lamb, savory roast beef and succulent bacon. • 2-Chomp Munchies are fortified with a customized blend of nutraceuticals made from natural ingredients, baked in small batches and hand cut. They help provide dogs with the nutritional essentials for a long, healthy life. Flavours are crunchy peanut butter and lamb. • PrOmega Powder is an all-natural dietary supplement for dogs and a great source of essential fibres and proteins. The core ingredients are hemp protein powder, MSM, FortiFeed and BioMOS. • PAWZitive Therapy Conditioning Stick protects pets pads from the cold, ice and salt. It provides protection while it soothes and moisturizes chapped pads with no residue and is completely absorbed. • MSM Soothing Tropical Gel is a cool, water-based gel that easily rubs in to quickly quell inflammation on the spot. It's great for sore, tight muscles and aching joints. MSM's anti-inflammatory and pain-reducing properties prevent pain in nerve fibres and decrease scar tissue. "Just as proper, balanced, proactive nutrition is important to a family's health, it is equally important to the health of the family pets," Daymond said. "As part of a wholesome balanced diet, NuHemp's innovative and therapeutic gourmet functional foods and supplements will help provide pets with the essentials for a long, happy and health life." KicX Nutrition Inc. is an established, innovative and vibrant product development company that has injected new energy into both the retail and commercial sectors by introducing natural, environmentally responsible product solutions that deliver. To learn more about KicX and its revolutionary line of NuHemp products, call (519) 836-8443; E-mail: info@kicxnutrition.com; or go to: www.nuhemp.com. To learn more about Hempola Inc., call 1-800-240-9215 or visit hempola.com. 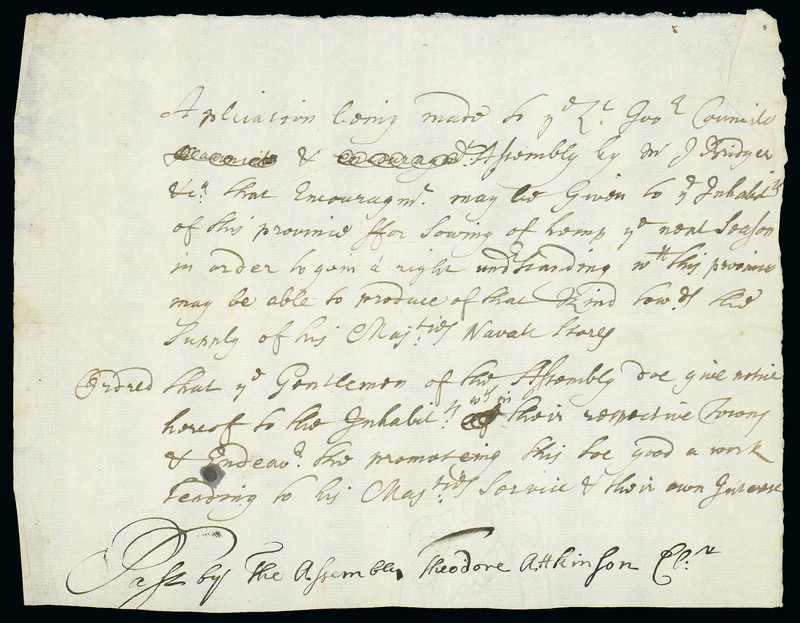 Lot 10 - 1699 (c.) New Hampshire Hemp Act, handwritten original copy of the act that was passed sometime in 1699 promoting the planting of hemp to support the British Royal Navy, Very Fine, interesting historical collateral. Estimate $750-1,000. Image courtesy of Matthew Bennett International. Late last week in a PR Newswire press release Matthew Bennett International announced that on October 7 they will auction what is arguably the finest collection of American Colonial and early United States mails ever assembled - The Siskin Collection. 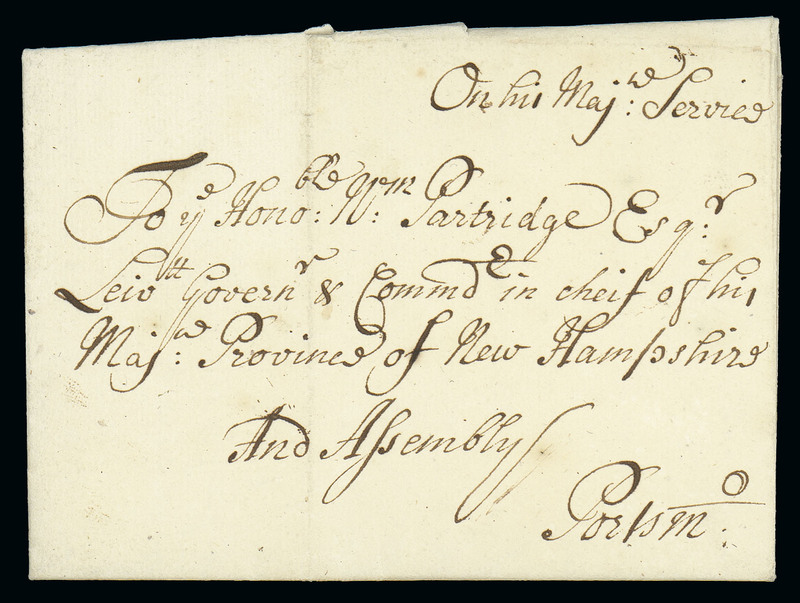 Important historical documents up for auction include a letter dated 1698 from Lord Bridger encouraging the people of New Hampshire to grow hemp along with the original document known as the Hemp Act of 1699. 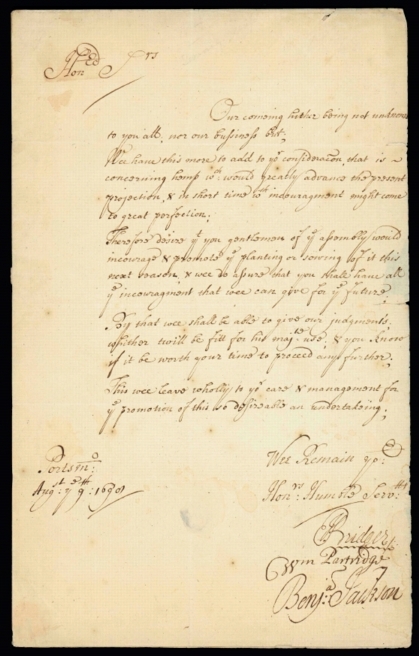 These documents are Lot 9 and Lot 10, part of Sale 290 , Colonial & Early United States Mails Lots 1-73 - Parliamentary Post (1692-1783). The Siskin Collection will be auctioned on Friday, October 7, at the Four Seasons Hotel in New York. Pre-auction viewing will be at the same location on October 6-7. 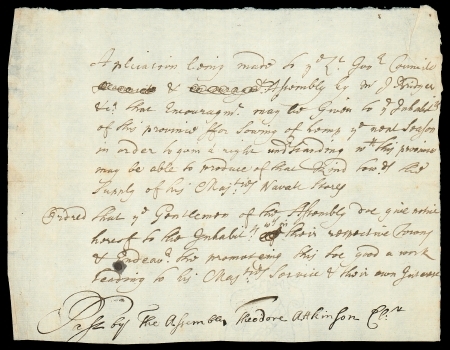 Bids for the auction will be accepted via mail, fax, online, eBay Live, and live on the phone. 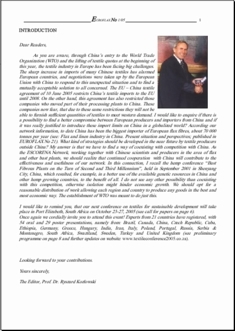 For more information please see the Matthew Bennett International web site at http://www.bennettstamps.com. 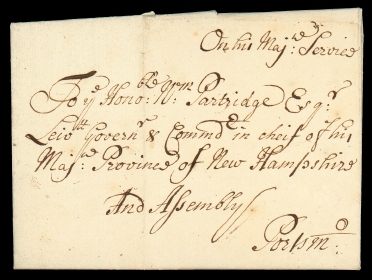 Lot 9 - 1698 (Aug. 9) Portsmouth N.H. to Boston Ms., datelined folded letter signed by Jonathan Bridger, William Partridge, and Benjamin Jackson, endorsed "On his Maj: Service", addressed to "Wm: Partridge, Lt. Gov & Commander in chief of his Maj: Province of New Hampshire and Assembly", carried by courier, Very Fine and choice. Estimate $4,000-5,000. Images courtesy of Matthew Bennett International.